Delta, a loggerhead sea turtle, spent the first 15 months of her life in an aquarium tank, but now she is swimming free in the Atlantic Ocean, courtesy of the UGA Skidaway Institute of Oceanography and its Research Vessel Savannah. Delta was hatched on Tybee Island on August 19, 2012 as a straggler, a juvenile sea turtle that does not successfully leave the nest. She was taken to the Tybee Island Marine Science Center. There, she served as the Science Center’s Ocean Ambassador and educated more than 49,000 thousand visitor. Eventually, though, Delta grew too large for her tank and it became necessary to release her into the wild. Although the Atlantic Ocean is only a few steps from Science Center’s front door, the water on the Tybee beaches is fairly cool this time of year. Delta’s caretakers at the Science Center wanted to release Delta into the warmer waters of the Gulf Stream. The Tybee Island Marine Science Center contacted Skidaway Institute for assistance. 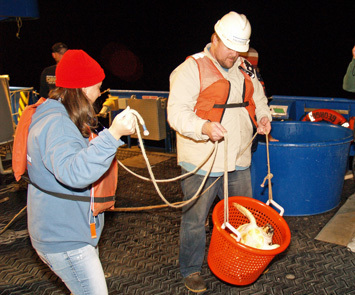 Conveniently, Skidaway Institute scientist Gustav Paffenhöfer had a similar research cruise on board the R/V Savannah scheduled for the coming weeks, and he agreed to allow Delta and her crew to “piggy back” on this trip. In preparation for her release into the wild, Delta was fed live crabs and jellies, which helped her bulk up to a healthy twelve pounds. Delta was also checked out by veterinarian Terry Norton from the Georgia Sea Turtle Center on Jekyll Island. With Delta and her team of handlers aboard, the R/V Savannah left the Skidaway Institute dock on Monday morning, Dec. 2, for the ten hour cruise to the edge of Georgia’s broad continental shelf and the western edge of the Gulf Stream. Captain Raymond Sweatte identified a favorable release spot, approximately 82 miles southeast of Tybee Island, based on the location of the shelf edge and by monitoring the surface ocean temperature. At the point of release, the water temperature was approximately 80 degrees Fahrenheit. 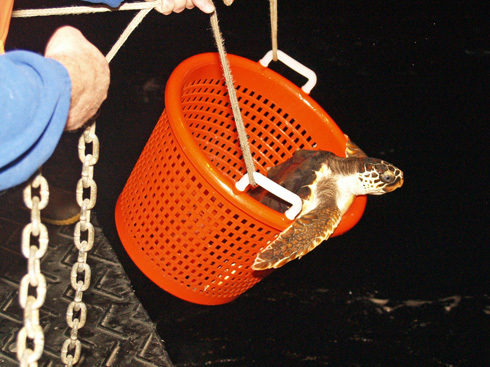 Tybee Island Marine Science Center staffers Michael Partridge and Beth Palmer carry Delta in a basket for her release. As she is lowered over the side of the R/V Savannah, Delta starts to climb out of the basket. Delta’s crew placed here in a plastic shrimp basket and lowered her off the R/V Savannah’s stern. Once in the water, Delta quickly emerged from the basket and swam out of sight. Tybee may not have seen the last of Delta. “Since loggerhead sea turtles return to their natal beaches to nest, we can expect to see Delta back on Tybee around 2043,” said Cody Shelley from the Science Center.